Searching a movie to watch for my portfolio I went at first for the new Woody Allen. Vicky, Cristina, Barcelona is a great movie but I decided to go and watch another as most BAIII had seen the previous one. 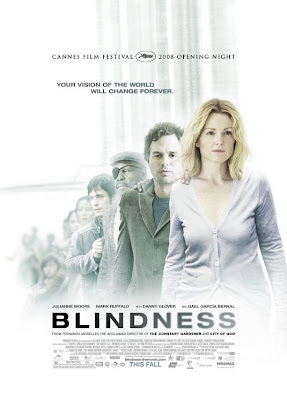 Blindness is a movie by Fernando Meirelles based on the novel of the same name by José Saramago. The movie pictures an unnamed town stroke by an epidemic of blindness. As the virus is unknown the government takes strict measures of confinement. We follow the Doctor (played by Mark Ruffalo) and his wife (played by Julianne Moore), who were amongst the first to arrive to the containment building, which resembles more a prison. The Doctor’s wife, who seems to be quite depressed and has a tendency to drink at the beginning of the movie, is apparently the only one immune to the virus. When the blind are left with no assistance by fear of contamination, she is the only one to stay and help (without telling the others that she sees). The situation of the blinds is horrible: they are left with very few food rations, no medical assistance and the hygiene is very bad. When the self-proclaimed king of ward 3 decides to bully the others and asks money and women for food, she organises the resistance against him until somebody sets the building on fire. Forced to leave confinement after saving all her friends from the fire, she leads them through the streets of the town, the inhabitants of which all seem to have turned blind. Ultimately the whole group finds shelter in her home. I really appreciated this very clever anti-utopia (btw. one of my favourite genre). The movie shows the danger of our egoistic society seeking secutity whatever the price. The blindness can be interpreted as divine punishment for our sins (egoism, avidity …), the doctor’s wife being a white angel. We can also analyse the psychological evolution of the doctor’s wife. Nothing more than her husband’s wife, she decides to stay with him. Feeling that she is useful she gets more confidence on herself and becomes the real leader of ward 1 (where she is confined). The last statement of the movie illustrates this by saying roughly that when all started to recover their sight, she was the only one to turn blind. A great movie I definitely recommend to all of you.